The Model AFH2 Air Flow Hood, Balometer is designed to measure volumetric air flow from diffusers, grilles and registers. The AFH2 Air Flow Hood maintains a running average of measurements in the desired units and provides the ability to manually record measurements with the manometer on a given time period. The highly accurate digital manometer has an auto-zero feature and will auto-zero at user-defined intervals. 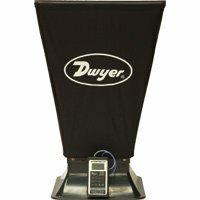 The digital manometer easily mounts to the flow hood with its magnet back-plate. Break down is very quick and easy as tools are not required. In addition to these features, the unit will alert you when its battery is running low in order to avoid recording inaccurate measurements. This lightweight flow hood is durable and easily stores into an included travel case. The AFH2 comes with a calibration certificate for both hood and manometer. Volume Flow Rate Units: CFM, l/s, m3/hr. Exhaust: CFM: 45 to 1176; l/s: 21 to 555; m3/hr: 76 to 2000. Exhaust: CFM: 29 to 1176; l/s: 14 to 555; m3/hr: 49 to 2000. Exhaust: ±3% of reading ±9 CFM (±4 l/s, 14 m3/hr). Span Stability v. Temperature: Better than 0.1% of range in use per 2°F (1°C). Zero System Accuracy: ±1 count (±0.05 Pascal typical; ±0.0002 in w.c.). Storage: 23 to 122°F (-5 to 50°C). Thermal Effect: ±0.1% of range in use per 2°F (1°C). Zero Drift: Negligible due to auto zero system. When auto zero set at 30 second intervals (2 minute warm up). Orientation Effect: Any 45 degree change 0.0004 in w.c. (0.1 pascal) typical. System Air Leak: 0.366 in3/hr (0.1 ml/min) @ 20 in w.c. (5 kPa) typical. Maximum Differential Pressure: 60 in w.c. (15 kPa). Auto Ranging Display: 0.375" high digits. Resolution: 1 CFM, 1 l/s, 1 m3/hr. Output: RS-232 serial interface (baud rate 9600). Memory Capability: 2500 readings in any engineering unit. Power: 8.4 V nickel metal hydride battery, installed non-functional, user replaceable (optional 9 V alkaline battery, installed non-functional, user replaceable, may be used in place of rechargeable). Dimensions: 30" x 24" x 24" (965 x 610 x 610 mm). Hood only: 2' x 2' (600 mm x 600 mm). Weight: 8.8 lb (4 kg). 2' x 2' hood balometer less digital manometer.